The plan is to connect a 4K TV, AV receiver/AMP, 7.1 speakers and PC. I may connect some other stuff later. Do any of you guys have or are planning to setup something like this? If so what sort of configuration do you have? I think my PC is powerful enough to deliver the 4K content I want, and with the GPU die shrink next year I think there'll be single cards powerful enough to push 4K well. So I'll probably upgrade when they come out. In terms of other media: streaming 4K via internet and 4K TV broadcasts; I've heard mixed information about this. Seems like reliable 4K content from those sources is a while off, it's almost like the 4K displays are ahead of the content available. Same goes for 4K blue ray players which aren't out yet as far as I can tell. I think most of my 4K content will be delivered from my PC via games. Anyway, the TVs I'm looking at include the SAMSUNG SUHD UE65JS9000 and the LG 65EF950V. I think both are really good, but I'm not sure if the OLED is worth the extra and significant premium! It'd be great if those TVs had a 120/144hz refresh rate, Displayport 1.3 and Adaptive sync, but that sort of technology seems to be restricted to PC monitors at the moment unfortunately. Why aren't the 4K TVs 4096x2160 pixels? Do you guys have any recommendations for AV receiver/AMPs? I've used a Denon amp with Bose speakers before and the setup was quite good. I'd really like a wireless setup this time though; if at all possible I want to avoid wires all over the place as much as possible. Do you think it's possible to get a quality wireless amp and surround sound configuration? First thing to understand is that there is no 4k content. There isn't even much 2k content. Your bluray player is already sending out heavily compressed images, the streaming stuff online isn't even laughably close, using high compression and low color depth to fake a high resolution. Uncompressed 1080p 8 bit video wouldn't even run on a gigabit internet connection, requiring over a terabyte to store a 2 hour movie. Blurays are running more than 20-1 reduction, with a great deal of image quality reduction along side what lossless compression can be done. 4k takes four times as much, and that's just at 24fps. 4k blurays are supposed to top out around 128Mbits per second to do 3840x2160 at 10 bits per color, instead of the 5Gbits+ it would take to do that raw. Lossless compression wouldn't get you anywhere near that reduction level. So, the question is how much do you really want to blow the money. 4k blurays will be higher fidelity than blurays, but it's still going to be a premium for something that doesn't truly exist. I believe as far as the 4k - 3840x2160 thing goes, that makes sense. If you were to take 4 1920x1080 (current HD) monitors and stack them 2 x 2, that would give you a resolution of 3840x2160. Meaning, calling it 4k is probably just a nominal number. My experience when I was forced to shop a couple of months ago was that 4K TVs display HD content about as well as HD TVs display SD content. In other words, lousy. I want to enjoy my movies, TV, etc. that I'm throwing at my TV. 4K is for when my next TV dies (knocking on wood) IF the content's being delivered. I should add...the last 'real' improvement to TVs was the change from Cathode Ray to LCD [and many even debate that]. ALL since has been an attempt by Manufacturers to continue the sales upsurge spawned by the LCD uptake. That includes...4K...3D...curved screens [good grief]...ad nauseum. My 65" 3D Smart TV is 4K and the picture is clearer/crisper than that of my 55" HDTV because it upscales content to suit the default resolution. That's not to say it is natural 4K, but it is improved some. Naturally, you're not going to get 4K content from a 480p video file, cos you don't make a silk purse from a sow's ear, but it is more watchable IMO. As for those 'curved screens', what a waste of time and money. I saw one on display at JB Hi-Fi when I purchased my 65", and really, I could see no real difference when viewing from a regular position/distance. Yeah, the top and bottom bezels are noticeably 'bent' if you pat attention, but there is no difference if you just focus on the picture. Nope, I wouldn't spend the extra bucks to get one. In fact, it didn't cost me an arm and a leg to get the 65" While most are $5000 and upwards, mine cost just $1579 on special. It's a Soniq, not a well known brand, but I've had 3 Soniq TVs in the past and all have served me well. In fact, I still have one of them, the 55", which is 6 years old and still in perfect working order. My daughter has another, a 32" that's 7 years old and still working perfectly. I gave my sister another 32" that's also still running fine. About the curved screens, yea, I've seen an advert that essentially says that because our eyes are curved then curved screens provides a more realistic experience! I don't even know where to begin with that one lol! I think I'd probably prefer flat, although if I had the choice to make it curve when I want, like that obscenely priced LG OLED model then I'd be fine with that as long as I'm not paying stupid money for something that seems gimmicky to me. Thanks for your input Psychok, from what you wrote it seems like we're a very long way off from transmitting 4K content from solid media like a bluray let alone across any significant distance. Do you think raw data like what you described will ever be available? Or is it just not worth it? Like starkers (you're not one of those guys that sits naked in front of their computer are you? ) I've given away my TV so I could do with a new one. About whether or not I want to blow the money, well I'll see if I can get a good deal on a 4K TV and then wait and see what the future brings; I may upgrade again. Maybe I should spend more of my budget on the surround sound/AV receiver setup? what do you guys think? Any suggestions? Curved screens do have an advantage, but they don't work because they're a brain dead application. Particularly true for LCD's, when you're watching a TV from an angle, you get a color shift, there is the glare issue as well, but that can be mitigated. Color shift happens across the screen because you see it from different angles, this problem is magnified as the size of the screen increases relative to your viewing distance. A curved screen negates the left/right color shift, which is most of the problem in a wide screen display, and makes the viewing angle exactly the same, from one point in the room of course. From everywhere else, it's just worse. Where a curved screen would actually be useful is if you had an entire room that was essentially a tv, but we're not talking 65 inches in a typical living room, you'd need a TV that small in a small bedroom for it to be useful. As far as the input goes, disk media is problematic. I expect things to go to flash or something new, you simply can't put terabytes of information on plastic and read it with a laser, imperfections in manufacturing already result in a lot of unreadable blurays. For the internet, I don't expect lossless media to ever exist, but at the rate of growth it's not unreasonable to expect 4k bluray quality in another ten years. I'm very interested to see in what direction this technology goes and what is used if they don't use flash. Off topic, 'Li-Fi' is supposed to be the next big thing for wireless data transmission, not sure if that will help with transmitting the terabytes of information needed for true 4K though. What psychoak means in the comment above....is that curved screens are only good for people who live lonely, sad lives on their own. So glad I opted for the flat screen, then... wouldn't want to be another statistic in that demographic. There is only one 'sweet spot' where the viewing quality is improved. All other viewing positions are actually worse..
... and once I'd found it, everything got nailed down to ensure its permanence. (you're not one of those guys that sits naked in front of their computer are you? Yeah, sometimes! However, I face the webcam the opposite way and put on my tinfoil hat so's nobody can read my mind to find out that I'm nekkid. Nope, there ain't gonna be any naked images of me going viral and breaking the internet... and believe me, they WOULD break it. I have enough shattered bathroom mirrors to attest to that fact. And to think, I once was God's gift to women. OLED's are vastly superior, they do not get rid of color shift entirely however. Color shift comes from two sources, the glass/plastic surface, and the design of the actual pixels. Pixels are designed two ways, stacked, and single layer. Single layer pixels are 3 part, or however many colors there are, and greatly reduce the clarity one can achieve because of the added space they take up. Any high resolution endeavor is going to be stacked, red/blue/green for instance. The color you see will change significantly because the further back colors can't show up as well from angles. How thin these layers are reduces how much shift you get. A cheaply made TV is almost entirely opaque from the sides, the color shift can be massive, to the point where simply viewing it from a reasonable distance results in a significant blue tint at the corners, or whatever color is on top. The good ones have very little color shift, so much so that unless you have an extremely large device, you wont notice it unless you walk to another spot in the room to compare against. Once you curve the device though, anyone not in that sweet spot is potentially viewing the tv from radically different angles, and the shift will be quite obvious. I read an article a couple years ago when the curved OLEDs first appeared (back when they were like $10-20,000+) which stated that the reason they made them curved to begin with was that was cheaper/easier to do at the time, it may even have implied it was the only way they could make them at that time. Now, they wouldn't tell the general public this information, so instead the spin doctor marketing went to work, and played it off as if curved TVs were the new "thing you had to have." Now I don't know if that article was surmising that or actually had facts to back it up, so take that as you will. Some years ago there was a thing called Cinerama, which was a circus type tent with a cinema inside instead. It had a curved screen that was floor to ceiling and wrapped around the side walls. The sound system was also all around.... above and below the seating, with 360 degree surround sound from all sides. It possibly was inspiration for this curved TV craze... to make the viewing experience more immersive, given that 3D television didn't take off as well as initially hoped. A very good thread. I'll stick with my Panasonic 65 inch, 3d Plasma tv till it dies. Hope that won't be for a long time. Thanks for all the info. Well now my decision is made for me. Guess it's time for a curved screen. True, it's always about the money, but surely LCD is much better on the eyes than CRT? Wouldn't that have been considered a significant improvement and worth the money at the time? Anyway, based on what Psychok said, it looks like 4K TVs/monitors are way ahead of true, uncompressed, 4K content unfortunately. Yes, that's what I said...it was the last 'real' improvement. LCDs are typically an improvement in heat emission...energy consumption...resource use - everything is 'greener'. BTW...in the mid 70's I got my first 'digital' watch... it was LED...LCDs didn't exist yet in 'mainstream'. Gas amplifier? Solid state and vacuum tube amps are the only ones I've seen anyone using for music applications. OLED's are getting closer to CRT quality, they should have black levels and contrast more in line with my defunct NEC Multisync FP2141SB soon... Oh how I miss it. LCD is much easier on the eyes, but it's not a better image. The problem with CRT is eye fatigue from the refresh rate, it can have absolutely amazing image clarity. They also don't have artifacts from motion the same way. Typical LCD's are limited to 256 shades, with the bottom being a very dark grey, and the top being a very light grey, but all grey. Achieving white results in over saturation, getting black requires dimming the display to where it's unusable. Irregularities in the pallet, as a result of these shade limitations, result in wrong colors, as well as imperfections creating image irregularities. When you see a rainbow colored bit of text for instance. CRT's have infinite shades, color is limited only by the input you can provide it, contrast is far beyond the pittances we have in LCD. Re CRT image quality...I once got blown away by the clarity of a 21" Sony...no matter how close I got to it...ie. 2 inches from the screen it was as clear as a bell ... [trouble was it cost the same as a decent computer system of the time]. When my TV went out I had to remove all the tubes and take them to the store for free testing. When I found the bad one, purchased a new one went home and put them all back in. Everything worked fine till the next one went bad. Try explaining that to your grandchildren as they just look at you and laugh. Look at it now. HD, UHD, 4k, CTR, LCD, Curved screens. No wonder we don't know what to buy. Nope! I didn't snore and I stayed on MY side of the bed... unless otherwise invited..
Not only that, I let them have control of the TV remote... then all I had to do was ask: "Please change to channel "?" for me.". Fech it, why should I get RSI in my thumb? I have 3 setups. I have a 5.1 setup in the basement and a separate 2 Chanel setup in another room plus my desk setup. Contrary to what some will say, you do not have to spend your life savings to get a decent picture or sound. That does not mean that I buy cheap box store products. I try to find great deals on second hand gear. There are some things that I bought new such as my 60" Plasma but I usually buy speakers and even amplifiers used because you can get more for your money. You just have to know what to look for. I even had someone from the US build me a tube amp which I had shipped to me because I got a good deal on it. 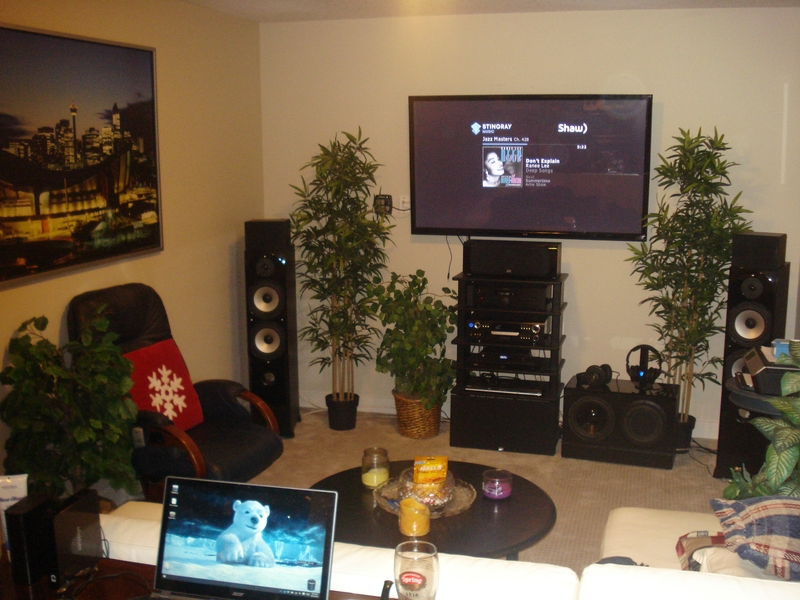 I would stick with a simple 5.1 setup for home theater, you don't really need 7.1 or anything larger unless your purpose is to be a showoff or outdo your neighbor. I am using a Nad receiver with Sincliar Audio speakers which include and awesome subwoofer to enhance the lows in some movies. This is what my setup looks like. You do not see the rear speakers that are on stands behind the sofa. Nice set up. Your screen is quite high up on the fall, i think I would neck problems looking up like that .